Open/Close Menu The Maori people are well known for their beautiful greenstone carvings. The Maori word for greenstone is pounamu and it is often referred to as Maori jade or New Zealand jade. 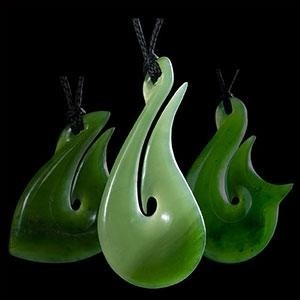 Greenstone carvings are works of art that are becoming increasing popular throughout the world. In his 2011 visit to the United States, New Zealand Prime Minister John Key presented United States President Barack Obama with a greenstone wahaika (Maori weapon). On this page you will find information on where Greenstone is found, what types of Greenstone there are, and why the Maori value it so much. These lists of facts are written for both kids and adults. Greenstone is found only in the Westland area of New Zealand's south island. It is mainly found near the Arahura and Taramakau rivers in Westland, in Milford Sound (in Fiordlandand), and around Lake Wakatipu in Otago. A town called Hokitika in the Westland area is referred to as the Jade capital of New Zealand. This town attracts tourist from all over the world. There are many shops offering all types of beautiful greenstone art there. Greenstone has played an important part in Maori history and the Maori consider it a treasure (taonga). For hundreds of years Greenstone has been used to make beautiful jewelry and due to its hardness has also been used to make tools and weapons. Greenstone is so hard that often the modern-day artist who carve it must use diamond cutting tools. Weapons made from greenstone were not only used in fighting but were often used in ceremonies, carried by chiefs to show their high status, and sometime offered as a symbol of peace. Before entering battle, Maori Warriors would sometimes wear jade around their necks for good luck. After killing an enemy, warriors would often take their jade for themselves. The Maori truly treasured greenstone items and would often pass down items made from greenstone from generation to generation. Greenstone is classified into the following categories by the Maori. Kako-Tea: Is dark green and has black spots. Kohuwai: Named after the green moss that grows in some streams. Kawa-kawa: This stone has a strong green color with varying shades. Inanga (Whitebait): This stone is a very pale green. Totoweka: Greenstone that is spotted (or streaked) with red. This stone is very rare. Kahurangi: A bright green stone with faint streaks resembling rolling clouds. There are several shapes that are carved by the Maori which have special spiritual significance for them. Beautiful greenstone carvings of these shapes hand carved by Maori artist can be found at The Bone Art Place. For more information about the meanings of these shapes see Maori carving designs.